On Monday Marco Rubio announced his candidacy for president. He may be half of the makings of the 2016 GOP dream ticket. The Republicans have two big problems to solve if they hope to win the White House next time around. No, I am not talking about cracking the Latin American ancestry vote. It would be good for the party to do that, though probably more essential in the long run than right away. And there are questions about whether putting a Cuban-American on the ticket does that anyway. Cubans are already among the country’s highest turnout populations (67.2% in 2012, according to Pew Research Center) and are a strongly GOP group. All the talk about the GOP needing to win Hispanics has missed that the so-called Latino vote is actually a collection of national groups. The two biggest blocks are Mexicans and Central Americans. These voters have similar concerns and cast their ballots in similar ways, that is, heavily Democrat. They see Cuban-Americans as entirely different from themselves and Cuban-Americans agree. So while Rubio’s parentage may help the GOP cut into that the “Hispanic” vote, don’t count on a huge movement to the party from those quarters just because he is on the ticket. No, the real Rubio effect (if there is one) will be for reasons that are completely different. Rubio helps fix problems rooted in geography and what you might call mood. For the geography question, think back on election night 2012. Remember how Karl Rove on the Fox Election Night desk could not believe that Ohio had gone for the president. Remember the camera following him down the Fox corridor to the statisticians’ office to challenge the call. So long as the party is shut out of California and New York, it must crack two regions. The Midwest is one. That’s why Rove was so shocked. With the rest of the Midwest (except Indiana) lost, Ohio was half of the game. The other half was Florida. With Rubio on the ticket, it is hard to imagine the GOP losing Florida. The “mood” question is something else. I use the term as an alternative to what people mean when they say ideology. I do not believe that the divisions in the party have much to do with ideology. If you press them, almost all Republican are for a significantly smaller Federal government presence in the economy and daily life, a stronger national defense (Rand Paul’s move to the center on security matters reflects his recognition of this), and greater fidelity to the original intent of the Constitution. But the reform wing of the party is intensely impatient to turn the government in that direction; the so-called establishment is more focused on the obstacles that must be overcome. This is not a new division for the GOP. From Lincoln’s election in 1860 to Reagan’s in 1980, the party has had to cope with recurring divisions between reform and old guard factions. And when split that way, the winning tickets have been composed of one candidate from the reform wing who was acceptable to the establishment and another closer to the establishment wing who was acceptable to the reformers. This is why I say that Rubio could be half the making of a dream ticket. In Rubio and Wisconsin governor Scott Walker, the party now has a pair of candidate who together both Florida and the Great Lakes states. Both come from the party’s reform wing but establishment leaders like and respect both. 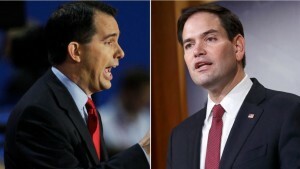 And to add to that both have family histories that speak of universally shared American aspirations – in Rubio the immigrant family that made their way up; in Walker the hard working parents of modest means (father a Baptist preacher; mother a bookkeeper) whose son did the same. Could any pair provide a starker or more appealing contrast to Hillary Clinton? Clark S. Judge is managing director of the White House Writers Group, Inc., and Chairman of the Pacific Research Institute. This article appeared on the Hugh Hewitt web site and is reprinted by permission.